We salute Sabre for giving us the opportunity to get hold of a genuine hand-built instrument without the astronomical price tag. Excellent value, luthier-built instrument. Superb neck. Customisation options. With the big brands pumping out guitar after guitar, it might seem that we're forgetting the little man here at TG. Occasionally, however, a new company draws our collective eyes, and Cambridge-based Sabre Guitars is one such marque. "Christian Howe started building guitars at the age of 13, before realising his dream and founding Sabre in 2009"
Its founder, Christian Howe, started building guitars at the age of 13, before realising his dream and founding Sabre in 2009 - but it's the price tags that have really caught our attention. 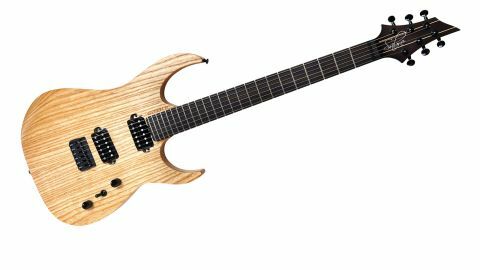 The Syren 6 is part of Sabre's new Stock Series, where each model is built in batches - you put down a 50 per cent deposit online, and once 12 orders have been made, Christian gets to work, you stump up the remaining cash, and get your handmade guitar four months later. That's a genuine luthier-made instrument for the price of a factory-made model. The hand-craftsmanship is immediate. Whip the Syren 6 out of its included gigbag and it's the weight, or rather lack of it, that grabs you first. That's down to the contours on the rear of the hand-selected swamp ash body: a triangle-shaped chunk is taken out around the jack socket, while there's the usual 'belly cut', plus a half-moon around the four-bolt neck joint. It's all extremely well carved - trust us, you'd see any flaws with that oil and wax finish, although a number of stain options are available for an extra £99. The parts are top-notch, too: Gotoh tuners adorn the elegantly carved headstock, while a Hipshot hardtail bridge, Graph Tech nut and Luminlay glow-in-the-dark position markers round off the spec. Best of all, however, is the maple/wenge neck: it's a joy to speed around, and while the ebony fingerboard's flat 406mm (16-inch) radius isn't exactly made for Wonderwall covers, it makes high-end acrobatics an absolute breeze to execute. "The Syren is one of the most effortless shred guitars we've played"
In fact, combined with the ample lower cutaway and our review model's perfectly set low action, the Syren is one of the most effortless shred guitars we've played. Pickup-wise, our guitar came fitted with Bare Knuckle's VH II (bridge) and The Mule (neck), which accounts for £120 of the asking price; the base guitar costs £979 when fitted with a pair of Sabre's Hydra humbuckers. As expected, the BKs deliver a supreme performance: the VH II's articulate distorted delivery covers everything from Van Halen riffery to Guthrie-style shred, while The Mule recalls classic PAF humbucker tones for harmonically rich chordal playing. And, hey, if that doesn't sound like your bag, you can choose your own BK pups - after all, this guitar is being made for you! If you're looking for an alternative to the shred regulars, with a personal touch, you'd be well advised to stick your name down on Sabre's list - based on this evidence, it's going to fill up fast.